A lovely halfround villa of almost 95 m2 on a nice piece of land of 1.018 m2. 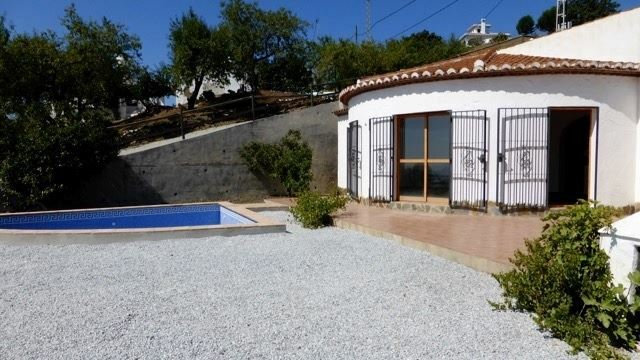 Directly connected with the paved road by a concreted entrance track; just three minutes from Competa; mains water and electricity as well as telefone and internet link. The property is well sheltered against the winds from the north, but wide open to the southeast with marvellous country and seaviews down to Frigiliana and Nerja. On the terrace in front there is an old unique well which has water all year around; it can be nicely integrated in the creation of the garden with flowerful Bogainvilleas, Jazmins, roses and climbing wines on the walls beside the house. There as well is plenty of space for a swimmingpool or other building extentions and for parking. The house consists of two bedrooms, two bathrooms, a big open plan kitchen and a huge lounge/dining area in a semicircle buildingpart. Big windows/doors are opening the inside living area onto the terraces and further out into the garden. All the windows and outside doors are made of pinewood designed aluminium and are double glazed. So in summertime the cortijo is wide open to let the light breeze in, in wintertime it is well insulated, has underfloor heating and a chimney above the roof to fit in another open fireplace if you like to have it.